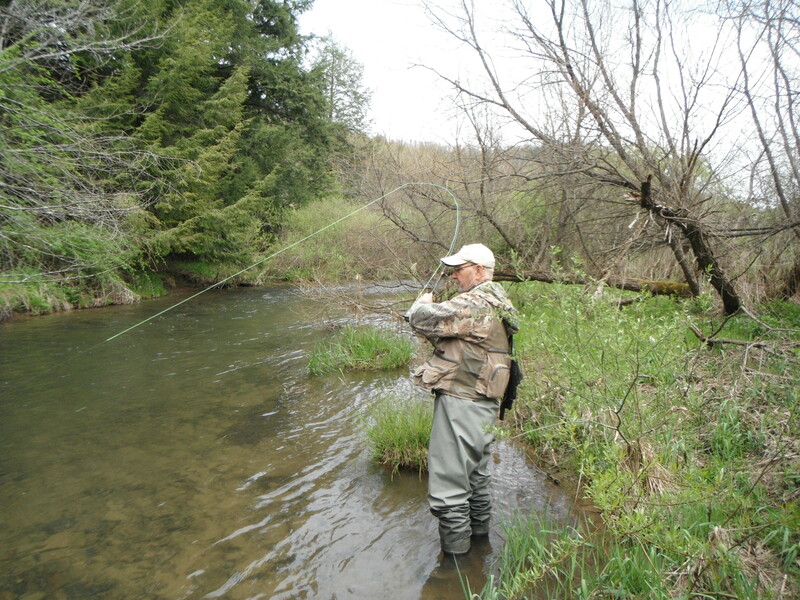 Each Spring, we spend a week in early May hunting gobblers in Forest County Pa coupled with trout fishing. Our base is a camp in Marienville,PA owned by my 2 brothers-in-law (Ken and Ron Hill). This year was no different, except for the weather. Cold temperatures mixed with snow and rain made both hunting and fishing a challenge. Ken (Butch) Hill’s grandson (Barney) did bag a “Jake” while hunting with Butch’s son Lance. Those 3 tagged up on the trout in the afternoon before the weather got nasty on the Tionesta Creek. Ron and I had good success on the North Fork of the Redbank and limited success on the Allegheny River (above Coudersport). North Fork/Redbank: This stream is located in Brookville, PA and has a fly fishing only area right downtown. Our first day we found a good Caddis hatch and fish rising to both Caddis and midges. In addition to Caddis, we caught fish on Cracklebacks, BWOs, and gray hackle flies. A successful day! On our second day, the weather turned colder (stream temperature 42 degrees) but there was a great Blue Winged Olive hatch but no fish rising. We’ll be back and with different weather conditions, we believe there will be different results. Allegheny River: I’ve written about the headwaters of the Allegheny River before, and expect to be back in early June, but again with temperatures in the 40’s, fish were not rising. This was a momentous occasion, though, as we did find one riser in one of our hotspots and Ron made a good cast and caught his first trout (14″ Brownie) on his new Beaver Meadow 7′ fly rod. The fight is shown above. Can’t wait to be back. See you in June ol’ friend!